Why should Armenian Organizations work together to ensure resiliency in the face of the Syrian crisis ? The UN’s humanitarian agencies are on the verge of bankruptcy and unable to meet the basic needs of millions of people because of the scale of the refugee crisis in the Middle East, Africa and Europe, as senior figures within the UN have been signaling for a while. The majority of the UN’s humanitarian work is funded entirely by donations from individual governments and private donors, with agencies such as the UNHCR executing the work. The current humanitarian budget of $18B for next year is so far only half funded. In this context next year's UNHCR budget for Armenia has also been halved from $1.8M (in 2015) to $935K (in 2016). These budget cuts will be felt by the most vulnerable class of refugees. Armenia as a regional host country, has welcomed its fair share of refugees from Syria. The European Friends of Armenia has recently published a paper which analyses the response of the European Union, Armenia and countries in the Middle East to the Syrian refugee crisis. According to the study, it appears that Armenia is one of the top Eurasian countries in terms of refugees welcomed per inhabitant: it hosts 6 Syrian refugees per 1000 inhabitants, more than far richer European countries. To its credit, Armenia and the humanitarian agencies within Armenia have avoided housing refugees in camps and have so far not faced refugee homelessness like in other host countries. This is great news in terms of Armenia (and Armenians globally) acting on their universal human values. That said, five years into the conflict in Syria, over 50 percent of the population (around 11M) is either internally displaced or has fled the country. Armenia and the Diaspora, just like other entities, countries and continents like the EU were not only intellectually unprepared, it appears that we were all also operationally unprepared to face the scale of the crisis, and the epic movement of people: the largest since WW2. None of the current leaders of the Armenian world have seen anything of this proportion affect our nation in the last quarter century. But the Syrian crisis is not only a local crisis in Syria, or a crisis for Syrian Armenians. Today it's a global crisis affecting large countries, regions and continents. From a humanitarian perspective, the Syrian crisis is the humanitarian test of our times. We at the Armenian Redwood Project have long advocated that the Armenian response to this problem needed to be unite or work jointly with most Diasporan Armenian organizations and the capabilities of the Government of Armenia. While Armenia (with the help of International agencies and the Diaspora) has been able so to far provide refugee services such as health, education, sanitation and some socio-economic infrastructure, the demand - as we all know it - is much greater that the allocated resources. In addition, most of the affected Syrian Armenians are not all located in Armenia proper, but dispersed in Lebanon and/or parts of Syria. Unfortunately, our recent data from Armenia and Lebanon indicates that mostly the poor seem to be the ones that have been left behind in Syria. Whoever has left or is leaving, still arriving with almost no savings in their pockets at host destinations, leaving Syria's Armenians in exhaustion and desperation like the rest of the traumatized population. Some Armenians, like many other migrants, have even drowned while trying to cross the Mediterranean. It appears that over the course of the past few years, there were attempts by various organizations to coordinate " local united relief efforts to assist Syrian Armenians" in Aleppo, Lebanon, Armenia and elsewhere. Unfortunately, as time has elapsed these efforts seem to have gotten fragmented, and have thus limited the needed impact of the humanitarian intervention. The government of Armenia - through its Ministry of Diaspora - has tried to keep up with events, but it seems to have been unable to fully capitalize on this historic opportunity to unite and rally the vast resources of the Armenian trans-Nation and institutionalize the needed humanitarian aid in a systematic and continuous ways. Neither has the All Armenia Fund been able to address this challenge in the last 5 years. Even more, we can honestly attest that most Diasporan Armenian organizations seem to have lost the Resiliency they once demonstrated during the 1988 Earthquake in Armenia or the early years of Independence. The scale of the humanitarian crisis in Syria and the proportional failure (and sometimes indifference) of the collective Armenian response to it on the eve of the centennial of the Genocide has been frankly shocking. History will inevitably assess world leaders on their failures when it comes to the Syrian crisis. History will also assess Armenian leaders and Diasporan organizations who allowed themselves be consumed by commemorations of the Genocide centenary to the detriment of the Syrian-Armenian crisis. We at the ARP have reminded many that If we are a nation worthy of its name, we cannot work our way out of this disaster by looking the other way and just hoping migration towards Armenia and the West will be possible and solve the problem. Building on lessons learned from past calamities -- genocides, civil wars, the earthquake of 1988 -- we should have mobilized manpower and resources and focused on not merely an initial emergency response, but a long-term strategy designed to secure the safety and security of the Syrian-Armenian community. What we have done is inadequate, not nearly enough. We didn't do enough, because we only raised a few million dollars instead of the needed tens of millions. We didn't do enough, because our response was unlike America's historic response to the Armenian Genocide through Near East Relief. We did not do enough, because we went about with business as usual while the poorest Armenians were left behind. As we enter 2016, our nation has over 30,000 displaced refugees outside of Syria, and many others displaced within Syria, and thousands living in difficult conditions in Aleppo and Damascus. The Genocide centennial is over but the exodus is not. It is still not too late to better organize our collective response and live up to global humanitarian standards. In his bestselling book Why Nations Fail , world renowned Turkish-Armenian economist, Daron Acemoglu talks often about proper INSTITUTIONSas indispensable nation building tool. In 2016, Armenians can maybe look at the Syrian refugee crisis as an opportunity. A moment in history that infuses fresh human capital into Armenia; a time when we stop being victims of a distant catastrophe and rise up to save our own and others; an experience that can teach our organizations to work together and launch nation building institutions; a moment when after 100 years, when act as though we don't need to rely helplessly on Relief Agencies from distant lands to save our people. When the UN system and entire continents are unable to sustain aid to Syrian refugees, it is naive to still believe that fragmented Armenian organizational attempts can deliver the necessary aid. Rather, the Diaspora has an opportunity to organize itself along INSTITUTIONAL lines in alignment with international aid agencies and in cooperation with ministries of the Republic of Armenia. Professional platforms organized by areas of intervention are needed, and not feeble solo attempts. We at the ARP realizing the enormity of the needs, have partnered with UNHCR, Oxfam and the Syrian Armenian Relief Fund (SARF) and are still partnering with others (as of this date) along a very focused area of need: AFFORDABLE HOUSING to refugees in Armenia. The joint program does not distinguish between Iraqi or Syrian origin refugees, or political and religious affiliations among those refugees in Armenia. It is a needs based institutional program that operates according to guidelines and standard operating procedures. This transparent platform approach, will soon also have a "working group" comprised of various Armenian and International NGOs that will look at future improvements and sustainable solutions in the refugee housing domain. 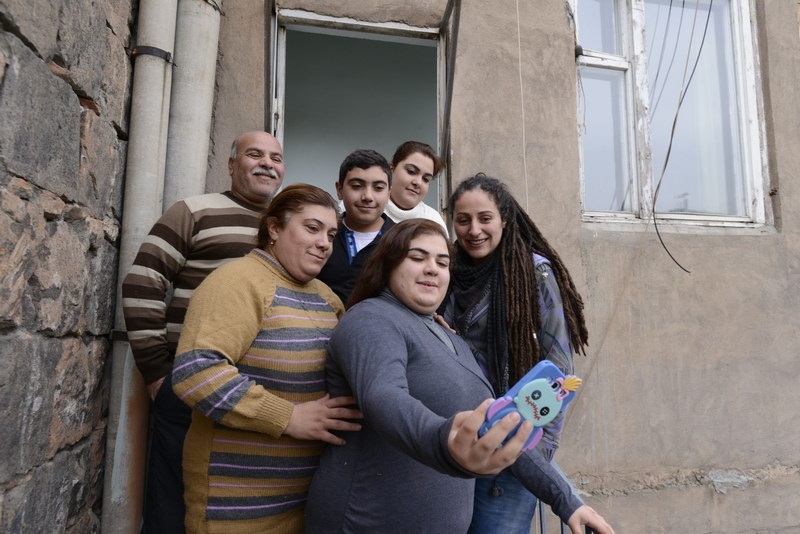 This effort while addressing a single focussed need (housing), is an example of cooperative and inclusive efforts that can leverage more resources from International and Armenian sources. In 2016, There are no reason why Armenian Organizations should not work together in the white space where there is full agreement (among everyone) like providing assistance to needy refugees seeking shelter in Armenia. On the contrary, not working together (for whatever reason) is sub-optimal. Our main point is that these INSTITUTIONAL approaches in the 21st century can help focus on building resilience and ensure that communities not only recover from a crisis but also improve the longer-term development prospects needed to move forward. If we approach this crisis through the perspective of RESILIENCE, we can not only survive, but emerge from it stronger. Looking at the Syrian Refugee Crisis not only as a challenge but also as an Opportunity, can allow us to take advantage of new social, cultural and economic possibilities we might have never imagined possible. In this context, we at the ARP remind the responsible elements of the Armenian nation, that it is imperative to have an integrated approach across geographies, functions and national systems including the ability to bring together ideas, work together and deliver coordinated actions. Very much like the global centennial committee efforts that were brought together prior to 2015, but for the sole goal of increasing our nation's resilience in the face of this crisis of epic proportions. I am writing to the Armenian leadership across geographies in the hope that we can persuade them, and others through them, that it is time to prioritize addressing this crisis now and work through a unified matter. The Armenians remaining trapped in Syria, then also the Armenians trapped as refugees, need the Diaspora and the homeland, and the Spyurk & Haiastan need to help them. If they do so successfully, our people will help themselves – morally and existentially, and both the homeland and the Diaspora will be better able to see themselves as active agents of their own fate. If they fail, they will have failed not only our kin in need, but ourselves as a nation.